A preview of the next Jamie Quinn Mystery, “Engaged in Danger,” can be found at the end of the book. 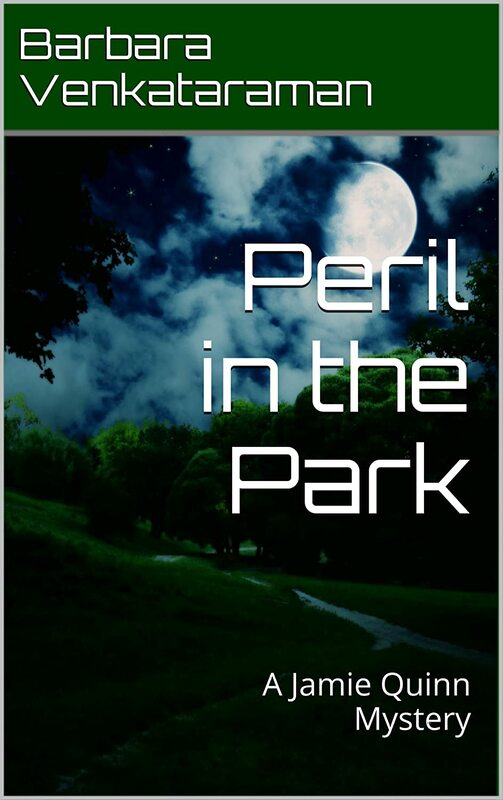 PERIL IN THE PARK is the third book in the fantastic Jamie Quinn series. I have loved the Jamie Quinn books and hope that Venkararaman continues to add to the series for years to come. I suggest that the books be read in order to fully grasp the plot and character development. In PERIL IN THE PARK, Jamie is developing a romantic relationship with the new park director, Kip Simons. Kip and Jamie were romantic as teens and had lost touch with each other. Soon after Kip assumes his new position, he runs into Jamie and their romance is rekindled. Kip is having trouble with vandalism at the park and suspects employees who are upset by being passed over for the director’s position. Jamie gets involved in the investigation of the vandalism due to her concern for Kip. When a private investigator dies at one of the park’s events, Jamie calls in her own P.I. and friend, Duke Broussard to investigate. The investigation is intriguing and the situation becomes very suspenseful when Kip becomes missing. Jamie and Duke are frantic to find Kip and they find out more than they bargained for. I love the characters in the Jamie Quinn series. They are realistic and believable. It’s easy to identify with Jamie and get drawn into the stories. In PERIL IN THE PARK, Jamie is still unraveling her family history. She has found her long, lost father and is trying to establish a relationship with him and his wife. P.I., Duke Broussard, brings wit and charm to the series. Duke has his own past to repair, as well. PERIL IN THE PARK is a quick, suspenseful read with wonderful characters. I would recommend the Jamie Quinn series to anyone who is a lover of mystery. The series leans more toward cozy mystery and is very enjoyable. I can’t wait to find out what Jamie gets involved in next. There’s a preview to the fourth book in the series at the end of PERILS IN THE PARK. The title of the fourth book is, ENGAGED IN DANGER. Is an engagement in the works for Jamie? I hope to find out soon! A preview of the next Jamie Quinn mystery, “Peril in the Park,” can be found at the end of the book. 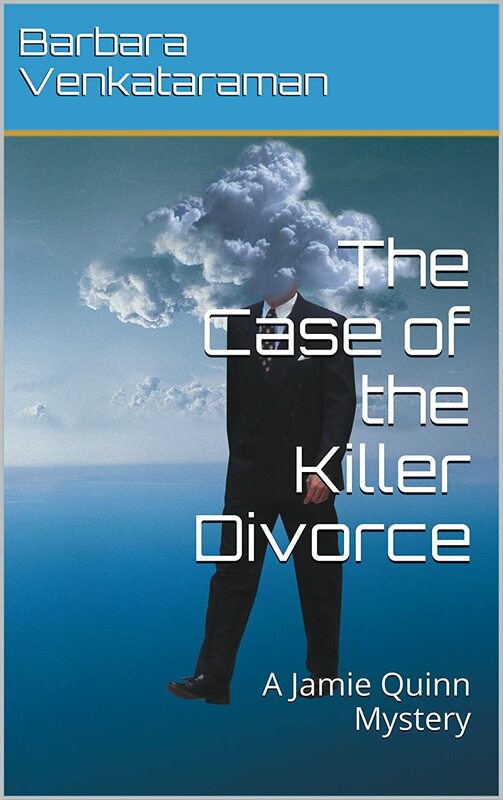 “The Case of the Killer Divorce” by Barbara Venkataraman is Book 2 in her Jamie Quinn series. I enjoyed this second book as much as the first. It’s a quick read and I found it hard to put down. After getting to know Jamie in Book 1, I was eager to find out what develops in Book 2. I was thrilled to discover that not only is Jamie involved in a murder mystery, but she is also discovering her heritage and experiencing a little romance! “The Case of the Killer Divorce” has all the familiar characters we were treated to in Book 1. The story continues from where “Death by Didgeridoo” left off. Jamie has gone back to work as a lawyer after taking some time off due to the death of her mother. She barely has time to get back into the working grind, when one her clients is accused of murdering her ex-husband. As Jamie is working hard to clear her client, she is also reeling with the disclosure of the identity of her father which her mother had kept secret. A sprinkle of romance is interwoven into the plot and this story is definitely difficult to put down. The Jamie Quinn series by Venkataraman is refreshing to read. Mystery with a little humor and romance makes a yummy combination. I can’t wait to read Book 3 and I hope that Venkataraman is able to continue this series for a long time. Source: Received for a honest review. Abigail MacKenzie has been trying to put her father’s tragic death behind her. But when a handsome stranger produces a random clue about her father’s shooting, hopes of finding her father’s killer come flooding back to the surface. Abigail is determined to get justice for her dad, even if it means learning the secret of a man with eyes that cut straight through the wall around her heart. After making a mysterious discovery that costs him his job, Ryan Newberry is happy to accept any position he can get. But when he realizes that one of the employees who’ll be working under him at the Washington Valley Hotel is Abigail MacKenzie, the sweet girl he met weeks before, he fears the past might be in danger of repeating itself. Ryan only hopes that his desires for his new front desk associate won’t lead both of them down a path of danger from which he won’t be able to protect them. This is a great romantic suspense with just the right amount of romance and suspense. At first, I was a little disappointed that the characters were so young. (College and Graduate age.) I tend to read books with characters closer to my own age. This disappointment soon disappeared as I was drawn into the story and I found that I could identify with these younger characters and their experiences. Best friends Abigail and Julia have summer jobs as desk clerks at the Washington Valley Hotel. Their boss is a handsome medical student, Ryan Newberry. Although dating is against the rules for co-workers, Abigail and Ryan manage to become involved. Abigail is haunted by the murder of her father when she was a young teen. Her father was a hotel manager and Abigail’s new summer position brings the memories flooding back. Her father’s murder was never solved and Abigail is determined to solve the mystery. When several people at the hotel are murdered, Abigail links the new murders to her father’s murder. She also links her new love interest, Ryan, to all the murders. Abigail puts herself in danger as she uncovers more and more of the truth. Gabriel, the Archangel and Messenger of God – yeah that Gabriel, visited Mary Miller. He told her, as the key she is destined to spread the Light and vanquish the Darkness. Her first assignment is to restore the soul the Walking Man. Sounds simple enough until she’s thrown in the face of evil, and then Joe Deacons enters her heart. This battle just got a lot more complicated. She must complete her mission without losing all she loves. This was an action packed, spiritual, paranormal book. Mary Miller has been chosen to spread the Light and restore the soul of a homeless man known as, “Walking Man.” She is under the guidance of Gabirel, the Archangel who is God’s messenger. As Mary follows Gabriel’s directions, she discovers powers within herself to fight the Prince of Darkness. The spiritual battles between the Prince of Darkness and Mary are amazing and suspenseful. Mary’s task of spreading Light is difficult. As a further complication, Mary becomes involved romantically with Joe Deacons. Joe falls in love at the first sight of Mary and instantly sets about sweeping her off her feet. The two become inseparable and Joe helps Mary with her mission. The suspense builds as the battles between the Prince of Darkness and Mary become more intense. Mary and Joe are at risk of losing everything – including their lives. I enjoyed reading this book. The message of light vs dark was powerful. I usually don’t read paranormal books, but found the spiritual component in this one very interesting. Anyone who loves stories about angels and God’s messages will love this book. Part of the proceeds of Princess of the Light will go to food banks. 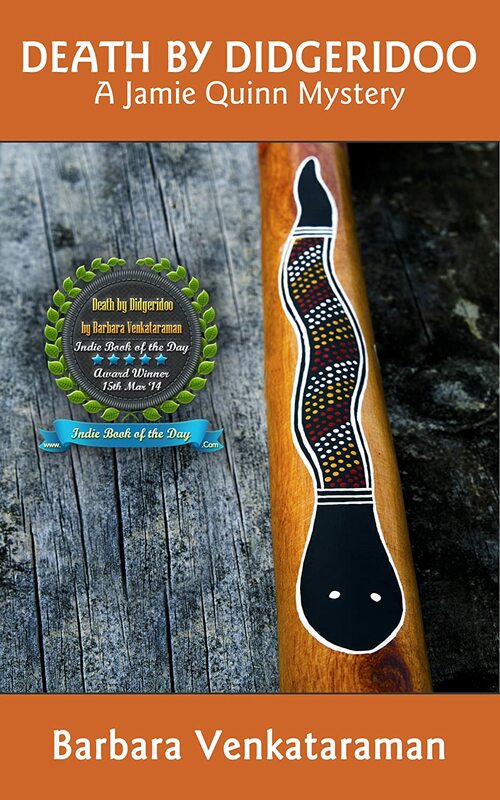 Death by Didgeridoo by Barbara Venkataraman is a tasty little mystery that hits the spot. With just a little over 100 pages, this quick read is full of everything a mystery lover wants in a light, little story. The characters are well developed and the mystery will keep you guessing until the end. Although Death by Didgeridoo is the first book in Venkataraman’s Jamie Quinn series, it is not necessary to read the books in order. Jamie Quinn is a character that is quickly likable and easy to identify with. She is still reeling from the death of her mother, when her cousin calls in desperation over the arrest of her son as a murder suspect. It seems that Jamie is the “go-to” lawyer in the Quinn family, no matter what field of law is needed. Jamie is sure her type of lawyer skills are not what cousin Adam needs, but she can’t say no to family. Proving Adam’s innocence in the murder of his music teacher is a daunting task. Adam has Asperger’s Syndrome and has admitted guilt due to his skewed communication skills. Death by Didgeridoo is a light mystery. Sometimes it’s nice to break away from intense suspense of a bloody murder mystery. I really enjoyed reading this book and will most certainly look forward to the others in the Jamie Quinn series. 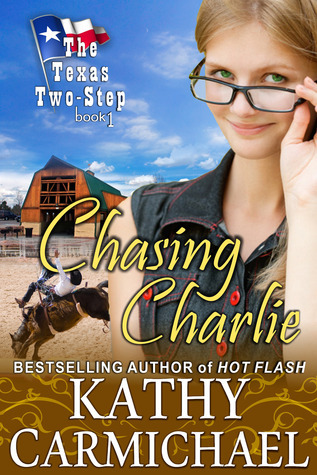 CHASING CHARLIE by Kathy Carmichael is a perfectly light, refreshing read for summer. It’s great for an afternoon of reading on the beach or by the pool. I really enjoyed this fun, charming romance about Charlie and Davis. Charlie is a librarian in a Texas town who has fallen into a routine and is bored with the men she dates. She has practically resigned herself to settling into a “librarian” lifestyle. Her roommate advises her to step outside the box and live a little larger. Charlie accepts the advice and starts living larger with the purchase of a shape hugging, red dress that is very atypical for a librarian. The dress transforms Charlie into a knock-out and draws the attention of her most handsome library patron, Davis. Davis, an accomplished businessman, frequents the library to research cowboys and ranching. He’s ready to allow someone else to manage the family business so that he can pursue his dream of becoming a cowboy. Also, Davis would love for his widowed mother to accept the marriage proposal from her long-time companion who will be leaving the country soon. He knows his mother will never agree to the proposal and leave the country until she sees that Davis is settled. Davis devises a plan to find a temporary fiance’ to show his mother that he is settled so that she can pursue her happiness. When Davis spots Charlie in the red dress, he knows she will be perfect for his scheme. Charlie reluctantly agrees to Davis’s plan and the two embark on a humorously staged romance that quickly becomes not such a farce after all! Problems abound, however, with Davis’s reputation as a handsome, little-black-book owning, bachelor. Also, Charlie has a very strong dislike of cowboys. Throw Charlie’s two over-protective brothers into the mix, and the combination makes a very good story. CHASING CHARLIE is the first book I’ve ready by Kathy Carmichael and it definitely won’t be the last. Luckily, this is only the first of her Texas Two-Step Series. I’m looking forward to more delightfully refreshing romantic reads by Carmichael. Texas Ranger Caleb Graham has the assignment of evicting a blacksmith from government property. Soon after meeting Rory Foster, Caleb realizes that this blacksmith is a woman. Aurora, (Rory), has no intention of being evicted and insists the land is her birthright. Caleb has quite a battle on his hands as he is determined to carry out his assignment and Aurora is determined to keep her land. Through no fault of Caleb’s, the lady blacksmith becomes injured. The injury is severe enough to need medical attention and Caleb transports Aurora to a neighboring ranch that has a doctor on staff. While Aurora’s wound is being treated, Caleb discovers that his kidnapped younger brother, Benjamin, is being held at this ranch. Caleb, Aurora, and Benjamin are a trio that must make an escape. It’s Caleb’s intentions to return to his family’s home with Aurora and Benjamin. As the kidnapper and his posse are in pursuit, the trio ride for their lives toward The Circle Eight Ranch. CALEB is the third of five in THE CIRCLE EIGHT series. Each book can be read as a stand alone novel, which is how I read CALEB. This is a self-published book by Beth Williamson writing as Emma Lang. I thoroughly enjoyed THE CIRCLE EIGHT: CALEB. I loved the character Aurora. She is a tough western woman with a sassy mouth. Her manner of speech shocks Caleb, who is not accustomed to women talking and behaving the way Aurora does. Aurora loves being a blacksmith. As an only child, she was taught by her father and is very proud of her craft. She fights Caleb like a wildcat to hang onto her land and continue being a blacksmith. Caleb sympathizes with Aurora, however, there is nothing he can do about helping her keep her land. Prior to 1840, women could not be legal landowners in the state of Texas. As a ranger, Caleb must uphold the law. Caleb is a great match for Aurora. Although, there’s little time for romance while being chased by an angry kidnapper, the two fall in love. Caleb was raised in a large family and is dedicated to them. He was astonished to find his missing brother and is eager to return him to The Circle Eight Ranch. Managing to escape and travel toward home is a venture Caleb wouldn’t have been able to undertake without the strength and bravery of Aurora. The venture is made even more suspenseful with the sparks of romance between the two. I found THE CIRCLE EIGHT: CALEB to be a very enjoyable western romance. It was hard to put down. 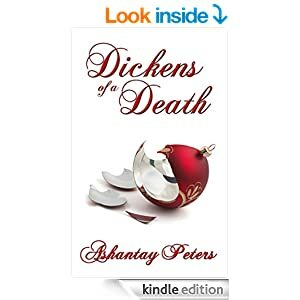 There are several twists and turns and the characters are wonderful. There is more action than romance in this novel, however, the romance is quite spicy!